Add your company’s listing to Folio: Partner Studio Today! It's easy to get started -- in just a few simple steps, create a FREE online listing, or upgrade to an enhanced or premium package designed to maximize company's reach. As a contributor on the content marketing platform, your content will be shared with the Folio: and Min community through their homepages. Folio: Superbook maximizes your company’s exposure and qualifies you as a thought leader within the industry. Our premium listings allows you to publish your content directly to foliomag.com and minonline.com along with Folio: and min's social media outlets, newsletters and even Folio: magazine. With the 2015 Superbook Directory and Folio: Partner Studio, you can leverage our brands and audience to expand the reach of your content. 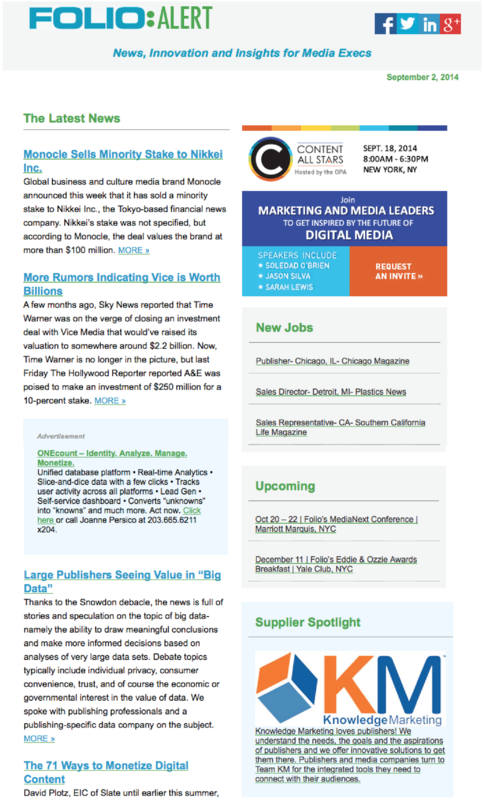 Distribute articles, case studies, press releases, white papers and videos. Manage and measure it all in an easy to navigate dashboard, all in real time.